It has been eight long months since I wrote a post here. For this I have no excuse except that work has been super busy and that I gave birth to a child this year. While I have been experimenting a fair bit in the kitchen I seem to have just lost my motivation to write. However, this is something that is getting corrected and now that I have a huge bank of fancy photos, the recipes are going to come up here faster, I promise! Getting back to this Salli Boti Pie. I came up with the idea of this pie around August of 2017 when we wanted to include something fun on the Bawi Bride menu for the Parsi New Year. Something that was essentially Parsi but still with a bit more jazz and pomp. My partner Subhasree of Hungry Cat Kitchen makes the best pies and it was while eating her legendary Pork Pot Pie that inspiration struck me. I wanted to make a Parsi Pie! The pie HAD to be meaty and I didn’t want flavours like herbs or white sauce masking the ‘Parsiness’ of it. I decided that there was nothing more ‘Parsi’ than a Salli Boti (well maybe Dhansak is but I can’t envision that inside a pie) and that I wanted to make it with not just mutton but also kheema. The official excuse was so that the kheema would create volume. The unofficial reason, I couldn’t choose between the two. And so, the pie was tested and re-tested and to our surprise received a great response during Parsi New Year. So much so, that it is now on our regular menu and it even featured on a special collaboration I did with Sassy Spoon during Navroze this year. The best part is that while I have shared the full recipe for the filling below you can always make this pie using leftover kheema and Salli Boti that you may have lying around. A perfect leftover makeover if I do say so myself! So, do try it out for your next dinner party and let me know your guests’ reaction. What's better than Salli Boti? 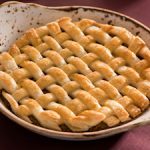 A pie made with the same flavours but MORE meat! Marinate the mutton in salt, ginger garlic paste and green chilli paste. Keep for atleast 2 hours, preferably overnight. Pressure cook the mutton for 35 - 45 minutes (3 - 4 whistles) until absolutely tender. Set aside. In a saucepan, heat the oil and add the chopped onions. Sauce until translucent and soft. Add in all the masala powders as well as the whole masala. Mix well and sauce for a further 3 - 4 minutes until the spice aroma starts wafting. Add the mutton mince to this mixture as well as the tomato puree. Mix everything, cover and allow the meat to cook in its own juices (about 20 minutes). Do not add water as you want a dry mix. Meanwhile, take the cooked mutton and shred it roughly. When the kheema is cooked, add in the mutton and stir until it is all mixed. Add in the jaggery and the vinegar and balance the flavours so your pie mixture is both sweet and sour - just like a sali boti. Ensure that all the water has dried out and that you have a dry mixture. 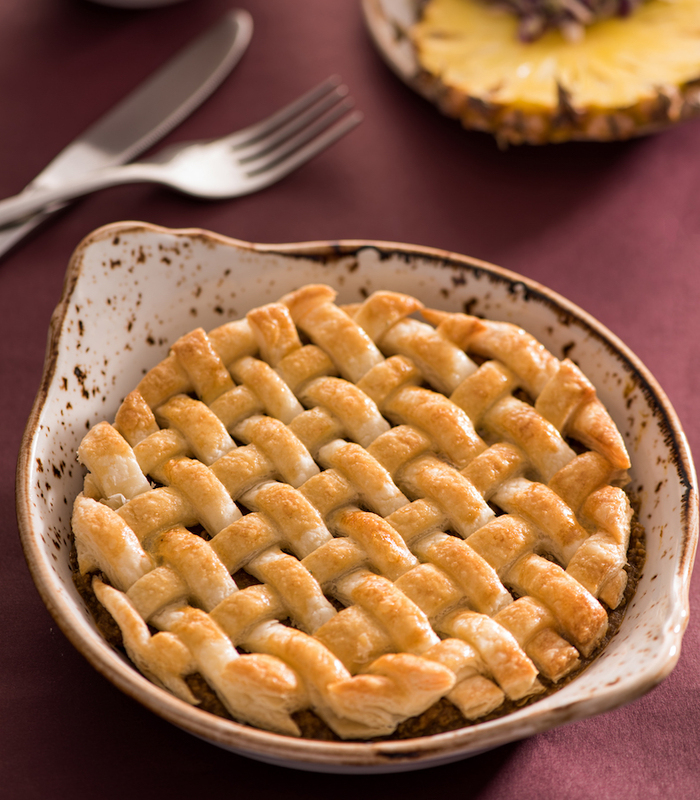 Just before serving, empty the mixture into a baking tray and top it with a puff pastry sheet. Brush the pastry lightly with egg.